Safety goggles! Bear in mind toxicity! 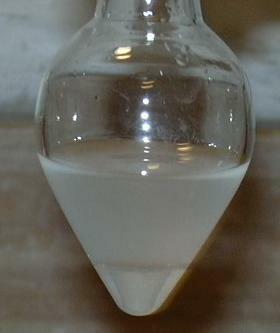 3 g chloral hydrate is placed in the flask, this is dissolved with a constant swaying motion in 5 ml water. Add 2 ml half-concentrated sodium hydroxide solution, plug, under intermittent airing shake a couple of times. Left standing the chloroform will settle to the bottom as a colorless, clear, heavy liquid. One can remove some with a pipette and test the smell (very carefully!). Due to base catalysis choral hydrate is decomposed into chloroform and formic acid.